﻿ Hua Hin Avenue Hotel, Hua Hin / Cha-am | FROM $32 - SAVE ON AGODA! Have a question for Hua Hin Avenue Hotel? When visiting Hua Hin / Cha-am, you'll feel right at home at Hua Hin Avenue Hotel, which offers quality accommodation and great service. From here, guests can enjoy easy access to all that the lively city has to offer. With the city's main attractions such as Hua Hin Night Bazaar Boon Chalern, See Mor Ice Cream, Hua Hin Night Market within close reach, visitors to the hotel will just love its location. At Hua Hin Avenue Hotel, the excellent service and superior facilities make for an unforgettable stay. A selection of top-class facilities such as 24-hour room service, free Wi-Fi in all rooms, Wi-Fi in public areas, room service, laundry service can be enjoyed at the hotel. In addition, all guestrooms feature a variety of comforts. Many rooms even provide television LCD/plasma screen, internet access – wireless (complimentary), whirlpool bathtub, air conditioning, balcony/terrace to please the most discerning guest. Throughout the day you can enjoy the relaxing atmosphere of the golf course (within 3 km), outdoor pool. Superb facilities and an excellent location make the Hua Hin Avenue Hotel the perfect base from which to enjoy your stay in Hua Hin / Cha-am. Hua Hin Avenue Hotel is a very nice place to stay. The room is large clean and comfortable. There is a nice balcony and the bathroom is fine. The swimming pool seems to be shared with a neighbouring hotel but it is quiet and relaxing. Booked the first night through Agoda and the staff matched the Agoda rate for the subsequent nights. 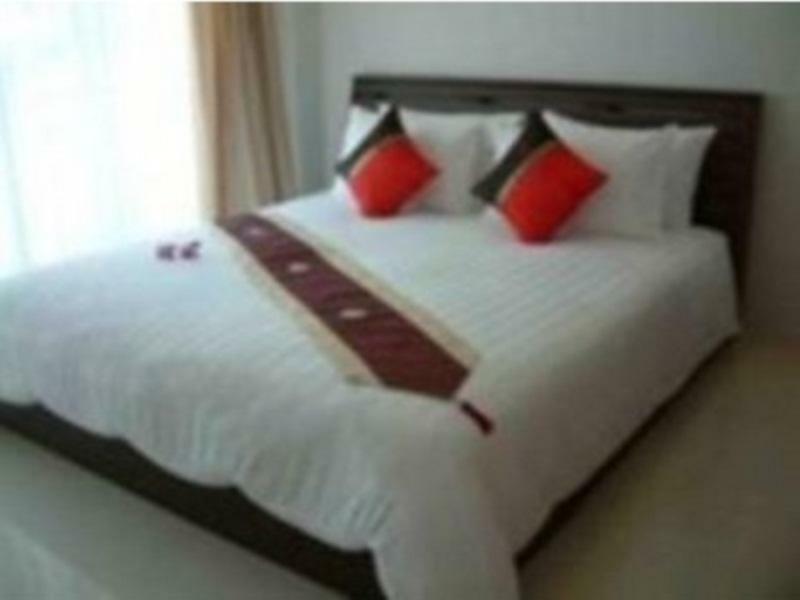 The location of this hotel is close to the Hua Hin night markets which has amazing shop stalls and restaurants. The only negative comment about this hotel is the lack of a restaurant but there are so many nice places to eat nearby so this isn't really a big issue. The hotel is excellent. The hotel is near to the night market (2 minutes walk) and 10 minutes walk to the beach. There is some great restaurant located around the hotel. The fresh market is only 5 minutes walk from the hotel. It is centrally located. This hotel location is very nice. - 1 minute walking distance to 7-11 - 2 minutes walking distance to night market - 2 minutes walking distance to morning market - 5 minutes walking distance from clock tower (where van from victory monument stop) - 0 minute walking distance to van station (heading to victory monument) - 0 minute walking distance to a shop where you can rent motorbike The staff is very helpful and friendly. Room is big and clean, however, the desk looks a bit old but its not a big deal. Position near cute little trainstation and nightmarket, wonderful family in reception and personally and genuine Thai. Very nice and genuin Thai family seems to run it. It`s very clean, nice pool chared vith another hotel. It`s close to night market and the very cute little train station. Don`t miss to take the train from Bangkok to Hua beacouse of the genuin experience and the ridicolous cheap prize. Try to get the room with the ``little Spa`` it`s just fantastic for the money. Marcus and Maria from Sweden. 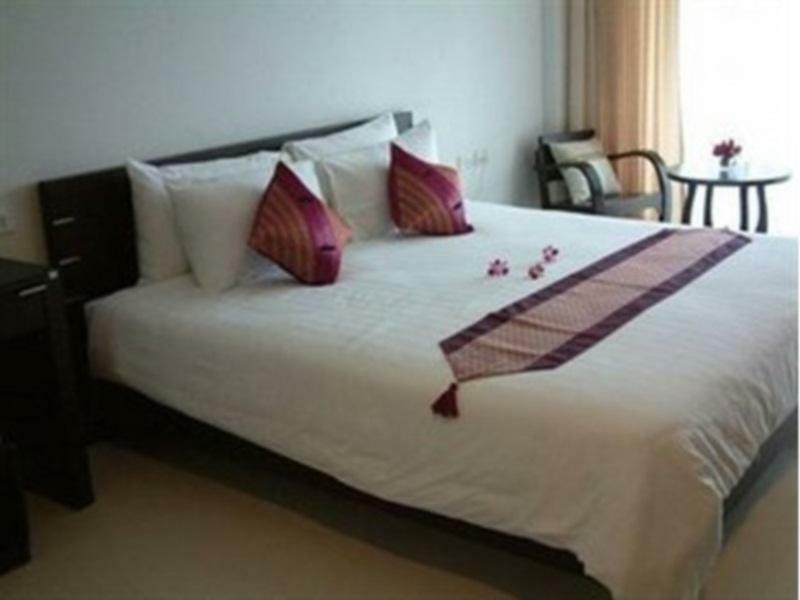 This hotel is centrally located in Hua Hin, right next to the night market. It's a long walk to the beach and a long walk up the stairs to the room. Despite asking for a low floor on the booking, I got four flights of stairs to climb. There was no room safe in my room. The shower is powerful but the sink has some sort of water saving device to reduce the flow to a trickle. But flush the toilet while the sink tap is running and you get full power from the sink tap. The bed is very comfortable and the room clean. The furniture is new, in the traditional Thai dark wood style. The green songtaew and red/white songtaew run past the front door plus the blue government SC bus stop to Bangkok Sai Tai is on the opposite side of the road. The rooms are great, the location is excellent, but it's a shame there wasn't an elevator or room safe in this 3* hotel. very convenient as it is nearby the night market (within 10min walking distance), and it is just opposite the mini van and taxi station. 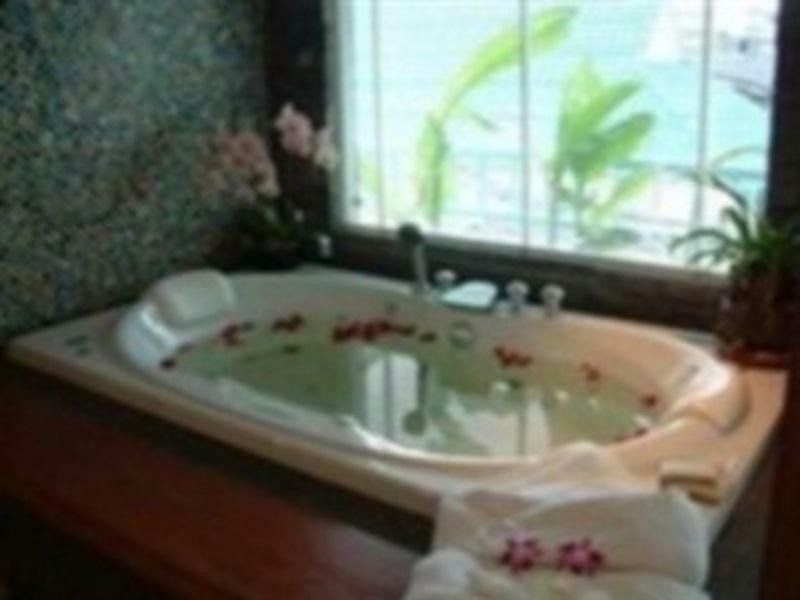 However, visitor can just take the standard range room which don't have the spa bath. First of all, if you need to use the wi-fi, then find another hotel. The advertise with having wi-fi in all rooms, but the speed are so low that you can not even load simple webpages without waiting a long time. The staff/management are fully aware of the slow internet so I guess they are not doing anything to improve it either. We stayed in the superior room that had ok comfort. Best thing with our room was the shower as it has lots of hot water. Otherwise it is a basic hotel with nothing really special. They share a swimming pool with some other hotels, but it is a small swimmingpool. Location is good, but if you are planning to spend time on the beach and in the bars I would find a hotel on the other side of the main road as it was at times very difficult to cross. Would not return as I am sure there are better deals around. walking distance to beach and restaurants, clean and comfortable. warm welcome after a 12 hour bus journey- early check in much appreciated, lovely staff and a comfortable room. Clean and centrally located - little balcony was lovely and although overlooking the road, the double glazing meant the room was very quiet. No facilities such as breakfast but cheap eating options a few steps away. Good cable Tv and clean bathroom. Very good value with the use of the hotel pool next door a bonus. Close to Starbucks. Close to late market. Easy to get on bus around Hua Hin. No issues whatsoever. I was skeptical about this hotel based on reviews. For only 60 dollars per night I got a large room with jacuzzi and balcony. Great location. There were a few mosquitoes every once in awhile. But this is Thailand what do you expect? The buses from airport in Bangkok to Hua Hin were also cheap and great! Clean and comfortable a/c buses. good location in the town centre: vans and buses to bangkok departing 20 m away, night market about 100 m away, railway station about 300 m away. clean, good looking rooms about 20 m2. no problem with noise from traffic. the swimming pool was quite small, about 6*8 m. there was an elevator in the building with the guest rooms, though this was not mentioned in the agoda web page. Early check-in at before 10:00am was arranged. Conditions are new. Pool available, sharing basis with nearby hotel. Closed to night market, but inside room is quite. Comfortable, clean and strategic location. No parking lot available is a minor weakness. is a small hotel , but is good for travel . staff is very good , check in and check out is fast . Excellent Staff, Nearby Night Market,Sleep Well. It is located very close to the night market. There are so many yummy seafood restaurants nearby.We had a geat time and will come back again. There is swimming pool shared area with Manthana hotel. It was good spending time with my husband there, just sometime water to tube is not hot. good hotel near the Hua Hin Night market, center city. Good location.1minute walk to night market and near train railway station. Clean room but the furniture and bathroom quite old. Eh, you get what you pay for. The room was clean and the staff was very pleasant. WiFi works. However, the hotel is desperately in need of a paint job and there were many tiles missing from our shower in room #5. It made the room feel run down and dirty, even though the bed was fresh. We only stayed one night, but that was enough.